Now, let’s talk about how we can use expressed needs – problems early adopters are aware of and are actively seeking a solution for – to find early adopters. As Lean Entrepreneur Author Brant Cooper said, it’s important to understand that being an early adopter isn’t a personality type. Your product’s early adopters will be uniquely-related to the business problem you’re addressing. A watering hole is where your prospects or early adopters gather for pleasure or for work. It can be a conference, tradeshow, seminar, restaurant, bar, hotel or professional association networking event. It can be offline or online. To find early adopters using expressed needs, you have to go where they look to find solutions to their problems. In other words, where do they go to learn, complain, exchange ideas, leave/read reviews, ask questions, etc? The watering holes will be completely different from one problem set to another. You need to find the right channels and right platforms where prospects seek solutions to their problems. Forums & Communities: One of my close friends works in the airline industry. Everyday, he logs into Airliners.net. Chances are, you’ve never heard of this forum, but if you work in aviation, that’s where you ask for help. Quora: Quora is part forum, part social network. It’s true gold for user research. I’ve used it many times before when I was seeking solutions. It’s very easy to message users there. Groups: LinkedIn and Facebook groups are great ways to find expressed needs. VarageSale founder Carl Mercier discovered local groups of people buying and selling items on Facebook. He created a better product for them and actually managed to convert them to his platform. Blog posts: If you can find blog posts on the topic you’re investigating, you can find early adopters. Maybe the author experiences the pain? Maybe the people sharing the posts? Maybe the people writing comments? How-to posts are clear expressions of needs. Comment threads are usually a good starting point. YouTube: YouTube is the home of How-to videos. The same model applies on there. Except, you’ll probably find even more people on YouTube! Personal ads: Craigslist or even personal ads in newspapers are great places to find expressed needs. AirBnB notoriously used Craiglist to find early adopters. Many others followed in their footsteps. 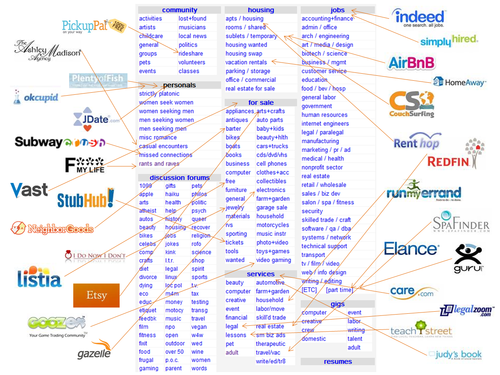 Enough that, investors called it the unbundling of Craigslist. Reddit: Reddit also had its own unbundling. Many users visit Reddit seeking advice or looking for solutions. You can find early adopters on Reddit (ProductHunt, HackerNews, etc) just by reading through the comments. Twitter: People share things on Twitter that they would not share on LinkedIn or Facebook. Maybe communications feel more spontaneous there? No matter the reason, pains and problems are more likely to be shared on Twitter. Setting up a few “Saved Searches” is a good way to passively find early adopters. Amazon: Although this might apply more to B2C, Amazon and specialty e-commerce sites are great platforms to find expressed pains. Through comments, reviews and reading lists, you can find early adopters. I’ve never used it myself, but maybe Alibaba is also a good platform for B2B entrepreneurs. Open Customer Service: Websites like Get Satisfaction or feature request boards are great places to find unmet needs and hone in on early adopters looking for solutions. This is actually what analytics startup Amplitude did to outdo the competition. Suppose you’re exploring a solution around A/B testing. You’d try to find where Data and Marketing people hang out. A community like GrowthHackers – focused on agile marketing – might give you access to hundreds of potential early adopters. We can add all these people to our list and keep searching for more early adopters. As with customer interviews, you want to follow emotions. References to “Love”, “Hate” or other strong words are important indicators of pain. Prioritize those. When scouring blogs, forums and communities, it’s important to differentiate the roles of participants. People asking questions and following answers are potential early adopters whereas people answering the questions are more likely to be influencers or (already) satisfied buyers. It might not be easy in B2B, but threads with more comments are better. They’re good indicators of the problem connecting with many people. It’s important to look at the date of publication. You’re looking for people actively seeking a solution. Not people who have moved on or have already found a solution. This guide should be a good start to help you put together a list of early adopters. From there, we’ll look at finding the influencers and reaching out for problem interviews.